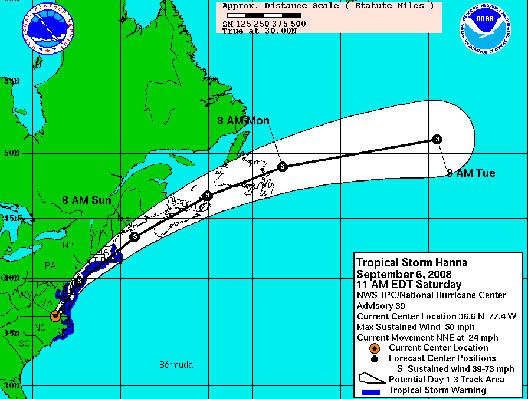 Tropical Storm Hannah continues heading our way. This is the 11AM tracking map from the National Hurricane Center, which puts the storm slightly closer to us than the 8AM track as it moves past us. Tropical storm force winds extend outward 200 miles from the center. (The further to the east that it veers the less severe the impact will be on us.) The forecast is still calling for very heavy rain. If the 4-6 inch estimates hold, it could present some major flooding problems in prone areas like Gowanus. If you’re out there or shoot any interesting pics of Hannah’s impact on Brooklyn send them our way at thegowanuslounge (at) gmail (dot) com or put them into our Gowanus Lounge Flickr Pool. Maps and charts from the National Hurricane Center here. They’re updated every three hours, with new tracks coming at 2PM, 5PM, 8PM, 11PM, etc.